Even if you've never had an interest in history, this upcoming book will surely find its way onto your to-buy list. Penned by Florent Gorges in collaboration with Isao Yamazaki, a prolific voice-actor over in Japan with many roles in video games, The History of Nintendo: Volume 1 has been translated into English so you'd better pre-order yours now because it's a limited edition. 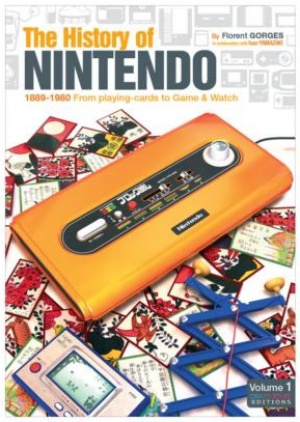 From Pix'n Love Publishing, Volume 1 covers the history of the company between 1889 and 1980, which gives readers insight into the roots of Nintendo and where it all began. From playing cards to the Game & Watch series, and everything in between, this 240-paged book can be yours for under $30 USD when it launches on 28th August. For the first time ever, over 500 card games, tabletop games, toys, electronic and arcade games are presented in detail in a single book! Six years in the making, this first volume of a long series invites you to discover the forgotten past of Nintendo, from its origins in 1889 until the early 1980's. 240 pages of exclusive content, illustrated with over 2,000 exclusive pictures, and a plethora of unbelievable documents and funny anecdotes await you. Volume 2 will cover Nintendo's accomplishments between 1980 and 1991 and will be published this winter. More information can be found on the product page, and when it's available to pre-order, you'll find out about it here. Oh wonder if it will be on amazon! Sounds awesome. While I will use it for bragging fodder if I get it, it also sounds like a fantastic read. I'll wait for volume 2, please. What a great idea and way past due really. A definate buy for any nintendo fan. Kudos gents. I wanna hear about their (failed) love hotel services back in the day. "From Pix'n Love Publishing, Volume 1 covers the history of the company between 1889 and 1990"
"Volume 2 will cover Nintendo's accomplishments between 1980 and 1991"
You just wiped out 60 bucks. wow. I'll be sure to add this to my collection! I normally don't buy books but this is an exception, being a huge Nintendo fan I've always loved their history including the toys and cards they created. Wait, what is reinforced plastic cover? That hard back or paper? $30!? Can I get it at a store? Don't think so. It's $29 which shipping included, worldwide. Vol. 2 sounds better to me. After I read it this will look good on my Club Nintendo DS Rack. No V.C. release with it? Looks like the death of the Virtual Console! Sounds interesting. I might check it out, even though I probably already know the finer points of Volume 2 by heart. I just might buy that thing. You're right that would be cool. Vol. 2 sounds interesting. May get that when it comes out. Metroid_Fan: Thanks for the spot. It's been corrected now. Sounds great. I am very tempted to buy it. It would be awesome to see pictures of Nintendo Brand Instant Rice*.